A Universal Payment Form allows your buyer to independently key in the product and the product price. This is an open payment form, in which the field is universal and open for any value or amount or type of product. By using this form, you maintain only one form, for all of your sales payments. Now, here are the steps on how to setup the Universal Payment Form. First, you need to know where does the Universal Payment Form located. 2. Scroll down to the section “Universal Payment Form Link,” you will notice that there is an existing link to your Universal Payment Form. 3. Click on the link to see your Universal Payment Form. The form will appear in your web browser. 3. For more information about GST setting with Universal Payment Form, click here. You can either set the delivery address as active or inactive. This depends on your needs. Let’s say your online business doesn’t require to deliver sold item through postal mail, then set it to inactive. 1. On the same page, same section, scroll down a little bit more. 2. Click “Yes” to display your delivery address in the form. 3. Click “No” to hide your delivery address in the form. 1. To view your payment form, simply click on the link. 2. You can share this link on WhatsApp, Telegram, Facebook, SMS or even Blog and Web. senangPay has made your life easier. 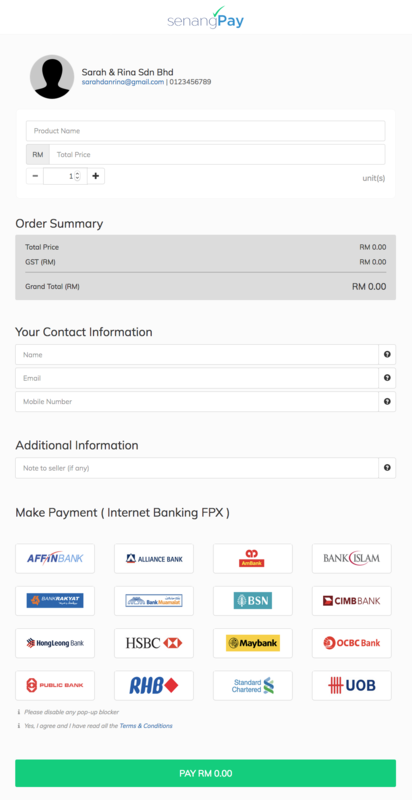 Your Universal Payment Form comes with “Pay Button” which you can use in your blog or in your website. 2. You will see a HTML code. 3. Copy this code and embed in any HTML-enabled platform such as Blog, Website, and Email. 4. When your buyer click on this button, it will redirect them to your Universal Payment Form. 1. What Universal Payment Form is. 2. Where Universal Payment Form is located. 3. 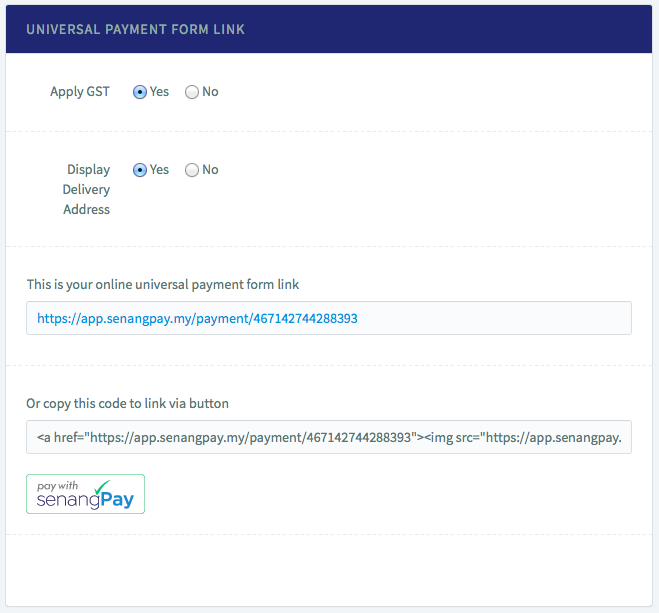 How to use & embed the “Pay with senangPay” button for Universal Payment Form. 4. Set delivery address active / inactive for Universal Payment Form.